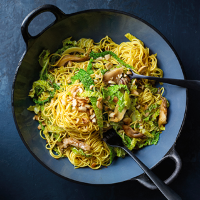 A speedy dinner that's low in saturated fat but full of flavour and texture. For best results, have your ingredients weighed out and prepped in advance. This dish matches brilliantly with a vibrant, hoppy ale.